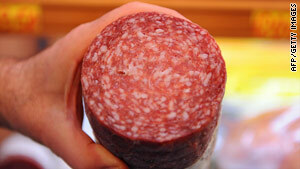 On Saturday, 18 different Daniele Italian deli products -- 1.2 million pounds of salami -- were recalled. (CNN) -- The Rhode Island Department of Health said Thursday that pepper-coated salami manufactured by Italian sausage company Daniele Inc. has tested positive for the strain of salmonella associated with a recent national outbreak. Specifically, traces of salmonella were found in samples of the black pepper used to prepare Daniele's salami, the agency said. Lab testing was done as part of a national health investigation. In recent weeks, the Centers for Disease Control and Prevention, the U.S. Department of Agriculture's Food Safety and Inspection Service, the U.S. Food and Drug Administration and state health departments have together been trying to determine possible sources for a multistate outbreak of Salmonella Montevideo infections, using DNA analysis of salmonella bacteria found in those reporting illness. On Saturday, 18 different Daniele Italian deli products -- in total, 1.2 million pounds of salami -- were recalled by the manufacturer and the USDA. According to the CDC, at least 189 cases of illness due to Salmonella Montevideo have been reported across 40 states since July. The strain is a common one, so public health officials noted that some of the illnesses may not be part of this outbreak. However, the preliminary results of a CDC epidemiological study suggest that salami was a possible source of illness in the outbreak. On Wednesday, Daniele announced it had changed its spice suppliers and spice specifications and is now using only irradiated pepper in its products. "The company's goal right now is to take prudent, proactive measures to do everything possible to remove any products that do not meet our high standards for quality and taste," the Pascoag, Rhode Island-based company said in a statement. Symptoms of salmonellosis, or food poisoning from ingesting salmonella-contaminated foods include diarrhea, fever and stomach cramps. A list of recalled products is on the company's Web site at http://www.danielefoods.com/.